Don't miss out! Click here to sign up for email headlines and breaking news alerts. 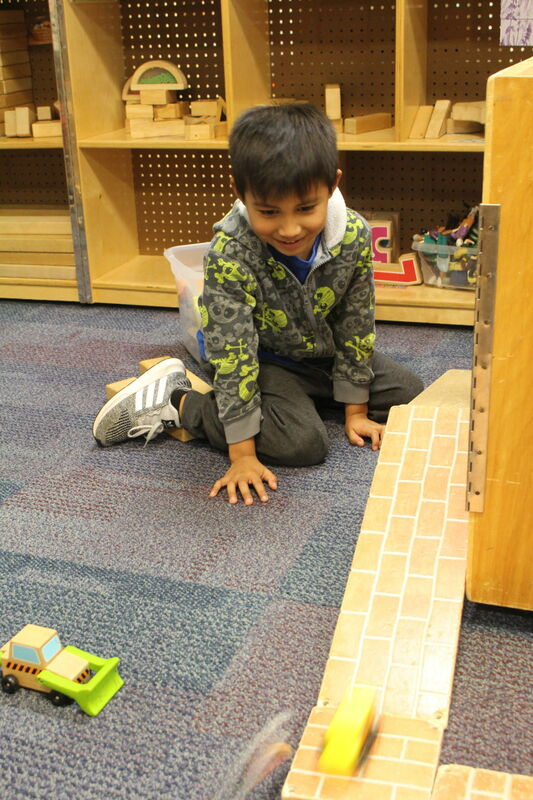 BUILDING — Hazelwood Pre-K student Dylan Garcia Lopez constructs a racetrack in the classroom. Using blocks, Legos, and race cars like this build the foundation for later STEM learning. DRAWING — Pre-K student Colyn Cornel draws a picture of her family. Students in Mary Green’s Pre-K class at Hazelwood Elementary work in various centers like art, math, writing, Legos, and blocks each morning. Applications for the North Carolina Pre-Kindergarten program in Haywood County for the 2019-20 school year are now available at Haywood County Schools’ Central Office located at 1230 N. Main St. in Waynesville. Students who are eligible for the program must be 4 years old by Aug. 31, 2019, live with a parent or guardian in Haywood County, and attend a developmental screening appointment. Children of active-duty military families are also eligible. The Haywood County Pre-K program is a state-funded program that offers a high-quality education designed to prepare 4-year-olds for school. The following elementary schools in the county have Pre-K classes: Clyde, Hazelwood, Jonathan Valley, Meadowbrook, and North Canton. This program is made possible through Haywood County Schools’ partnership with The Region A Partnership for Children and the Department of Child Development and Early Education. The benefits of NC Pre-K are longstanding according to a study released in May 2017 by UNC’s Frank Porter Graham Child Development Institute. Researchers found that children had better language, literacy, and math skills following participation in the state Pre-K program. • Language development and communication, and cognitive development. These developmental domains are critical to children’s overall well-being and success in reading and math as they enter school. Ashley Nesbitt plans to enroll her daughter Piper in Hazelwood Elementary School’s Pre-K program this upcoming school year. The UNC study showed that children who attended NC Pre-K had significantly better math and executive function skills at the end of kindergarten than children who did not attend the program. Low-income children in the program also went on to score better on language and math end-of-grade tests in third grade, compared to those who were not in the program. Researchers found that dual-language learners and children with lower levels of language proficiency also demonstrated similar or greater benefits on learning outcomes from participation in NC Pre-K.
Key to the program’s success is the high quality of instruction in North Carolina’s program, researchers emphasized. Moss said an average day of Pre-K consists of students playing in different centers, which are changed in the classroom frequently so that kids are always exploring and taking part in different activities. Pre-K students also get to participate in field trips, eat in the school cafeteria, and have access to after-school care. Fee-waived eligibility for the Pre-K program is based on family income, and other factors such as developmental disability, or limited English knowledge. There are four private pay slots available for $550/month at each school with a Pre-K class. Students in Pre-K may qualify for free or reduced lunch, and transportation may be provided. The deadline to submit applications to Haywood County Schools’ Central Office is April 4. Parents who have submitted an application will be called back to schedule a screening appointment for their child. Screenings will occur on April 24 at the Hazelwood Conference Center. For more information about the NC Pre-K program, visit the Haywood County Schools’ website at www.haywood.k12.nc.us and click on departments, then elementary education. Parents can also call Elaine Clinard at 828-456-2400 for more information about applying. Click to read the brand new feature magazine dedicated to food! Congratulations to the 2019 winners of the Best of Haywood County reader's poll. Would you like to receive our WNC Events newsletter? Sign up today!